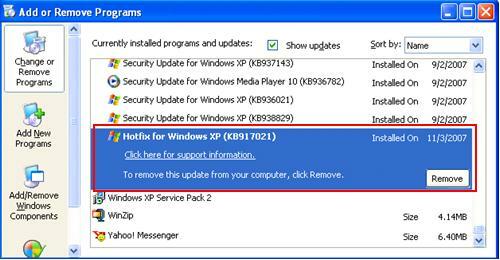 You should install this Windows XP wireless client update that is specified in KB917021 if you are using wireless zero configuration in Windows XP to detect and join wireless network. You can go to this Windows download page to get and install this update. After installing the update, you will notice there is a new update entry in you Add or Remove Program window. Before installing this update, you wireless zero configuration in Windows XP will have difficulty to detect and join non-broadcast (hiding SSID) wireless network. This wireless client update will give you new option to connect to broadcast or non-broadcast wireless network automatically in wireless network profile. Also it will send probe requests for non-broadcast networks only but not all networks. Note: Please don’t enable this Connect even if this network is not broadcasting option on ad hoc wireless network profile to avoid from connecting to unsecured ad hoc wireless network accidentally. Note: Somehow I still face the problem to connect to non-broadcast wireless network on some computers after having this update. Suspect it might not support all wireless adapters. This wireless client update will also correct the bad habit of wireless zero configuration to try scanning the infrastructure networks in preferred network list first for connecting, and then sends probe requests to try to connect to the first ad hoc wireless network in the preferred networks list (Hacker could monitor these probe requests and establish an unsecured connection with your Windows wireless client). 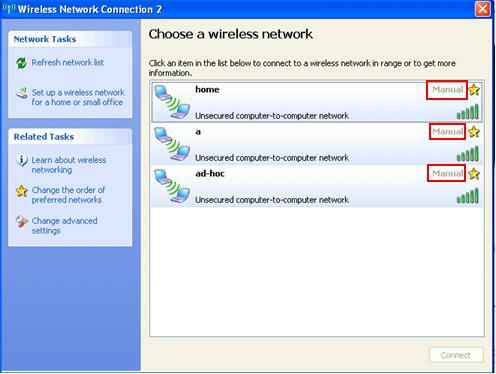 After installing the update, by default the XP wireless client does not send probe requests to connect to newly created ad hoc wireless networks in the preferred networks list, you must use the Choose a Wireless Network dialog box to manually initiate a connection to an ad hoc mode wireless network. On a computer that is running Windows XP with Service Pack 2, wireless auto configuration may create a random wireless network name and put the wireless network adapter in infrastructure mode. This operation is known as parking the wireless network adapter. Some wireless network adapter drivers may send probe requests without security configuration in search of a network that has the random name. An observer could monitor these probe requests and establish a connection with this Windows XP wireless client. If you have this update installed, the request to park the wireless network adapter includes a security configuration that uses a random encryption key. This security configuration uses the most secure encryption method that the wireless network adapter supports, so that having better security feature to avoid from connecting to hacker’s network. As an example, if the wireless network adapter supports WPA2, the security configuration uses Advanced Encryption Standard (AES) encryption together with a 128-bit encryption key. 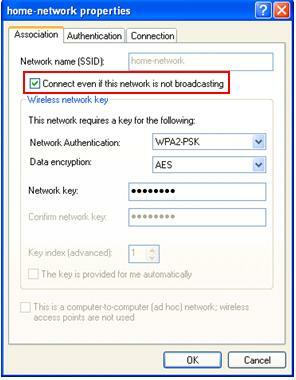 There is also improvement to allow system administrator to centrally configure WPA2 authentication and encryption options by using the Wireless Network (IEEE 802.11) Policies node of Computer Configuration Group Policy in Windows Server 2003 Active Directory domain. Play around with these new features and you will discover more! Return to top of "Windows XP Wireless Client Update with Service Pack 2 (KB917021)"! !